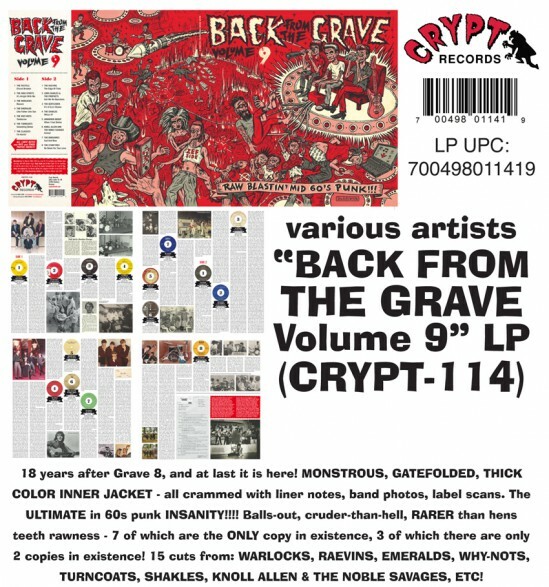 18 years after Grave 8, and at last it is here! MONSTROUS, GATEFOLDED, THICK COLOR INNER JACKET - all crammed with liner notes, band photos, label scans. The ULTIMATE in 60s punk INSANITY!!!! Balls-out, cruder-than-hell, RARER than hens teeth rawness - 7 of which are the ONLY copy in existence, 3 of which there are only 2 copies in existence! 15 cuts from: WARLOCKS, RAEVINS, EMERALDS, WHY-NOTS, TURNCOATS, SHAKLES, KNOLL ALLEN & THE NOBLE SAVAGES, ETC!